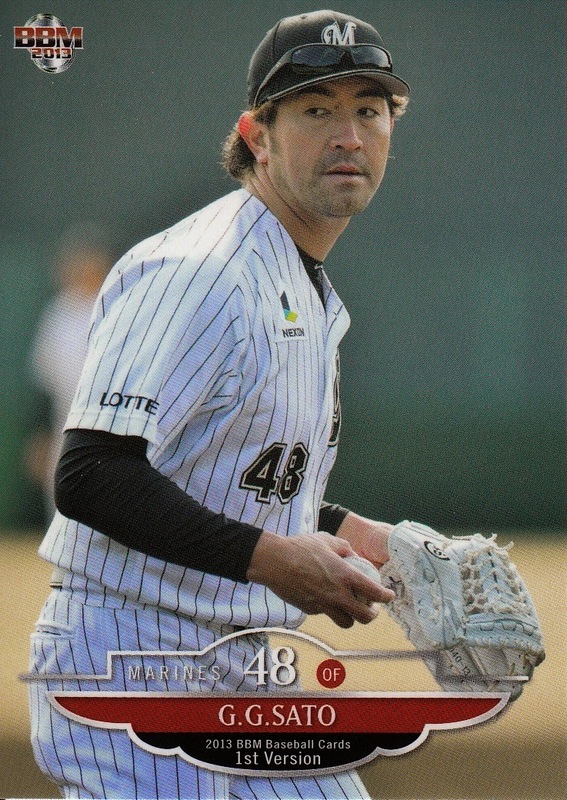 I was looking through the online gallery at Jambalaya of the cards from the new "Good-bye Players" (or whatever it's called) set that was released by BBM the other day and I discovered that there was another player who retired last year that I wanted to do a post about - GG Satoh. Satoh (whose real first name is Takahiko and I don't know why he's called "G.G." - UPDATE: Now I do. See below) is one of the few Japanese players to have signed with a US team out of college. 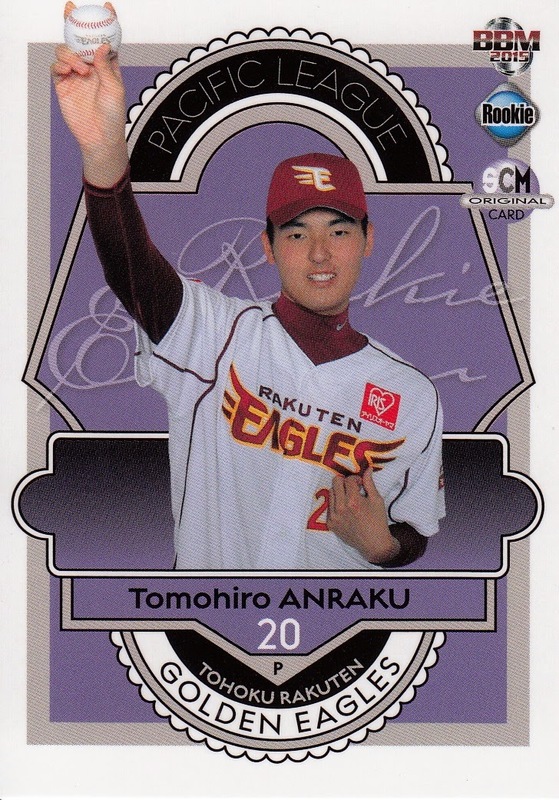 In his case, the Phillies signed him after he graduated from Hosei in 2000. He spent three years in the Phillies organization, rising as high as their Low-A team in Lakewood, NJ (in the South Atlantic League). He had been an infielder in college but the Phillies decided that his strong arm would be best used as a catcher. His first baseball cards are minor league issues from the US - the 2001 and 2002 Batavia team sets and the 2003 Lakewood team set. 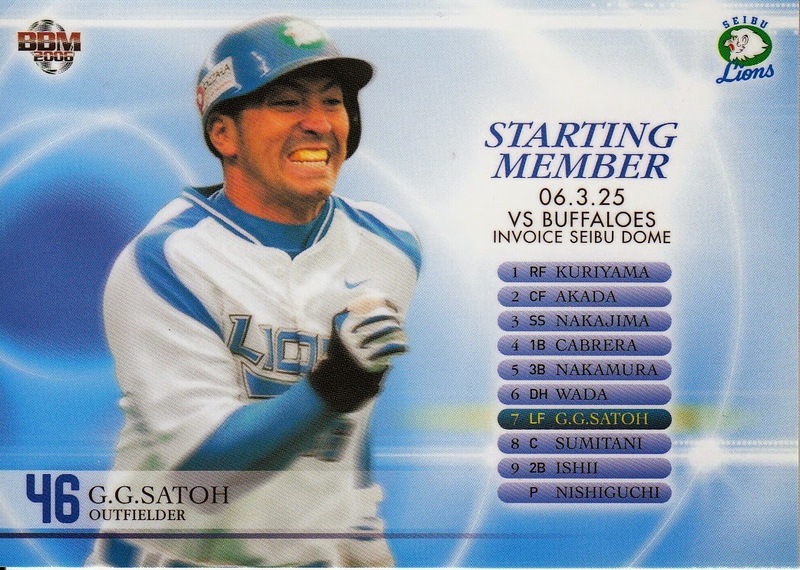 He played sparingly with the ichi-gun Lions team his first couple years but he became the Lions regular right fielder in 2007. He hit .280 with 25 home runs that year and followed it up by hitting .302 with 21 home runs in 2008 and .291 with 25 home runs in 2009. 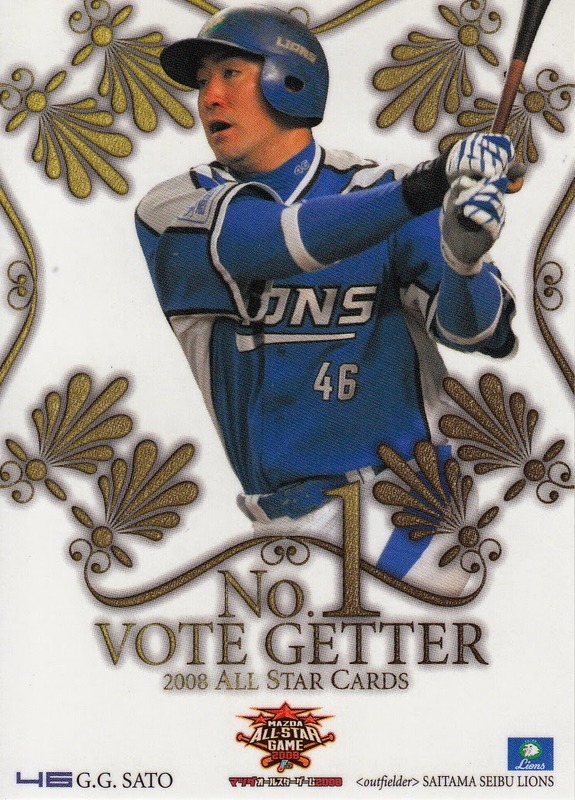 He was the top vote getter for the All Star games in 2008, the only time he made the team. 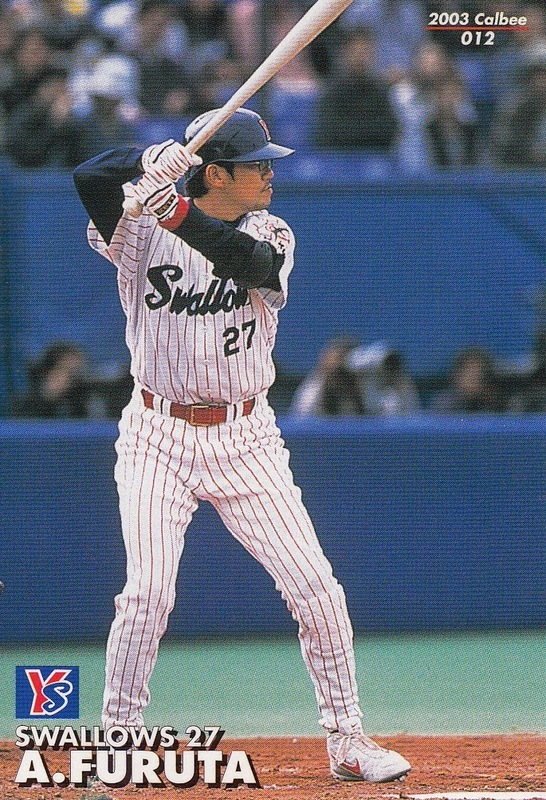 He was the starting left fielder for Team Japan in the Olympics that year and made a key error in the bronze medal game against the US that lead to the US team making a comeback and winning the game. 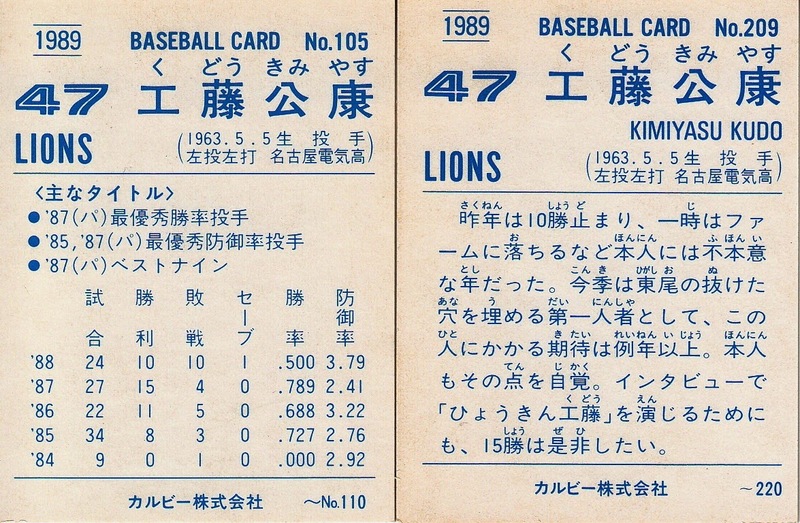 The Lions won the Nippon Series that year but Satoh missed the post-season due to injury. His numbers dipped substantially in 2010 and he was demoted to ni-gun halfway through the season. He had shoulder surgery late in the season and spent all of 2011 in the minors. The Lions released him at the end of the season. He spent 2012 playing for Fortitudo Bologna of the Italian Baseball League and then briefly joined the Roki Techno industrial league team. Before he could play a game for them, however, the Marines signed him. He only appeared in 30 games with the top team in 2013 and he spent all of 2014 with the ni-gun team. He was released by Lotte at the end of the season and apparently decided to retire. UPDATE: Got an email from Larry Fuhrmann that said that "Jiji is Japanese slang for grandpa. So I guess even at a relatively young age, his teammates thought he looked like an old man. And since Satoh is a very common surname in Japan, like Smith or Jones in America, he decided to spice up and stylize his name to stand out from all the other Satohs, so he started to call himself G.G. Satoh." Thanks for the explanation, Larry! It all started with a fax. The fax was received in 1988 by the International Sports Management and Consulting firm (ISMAC) in Kobe. 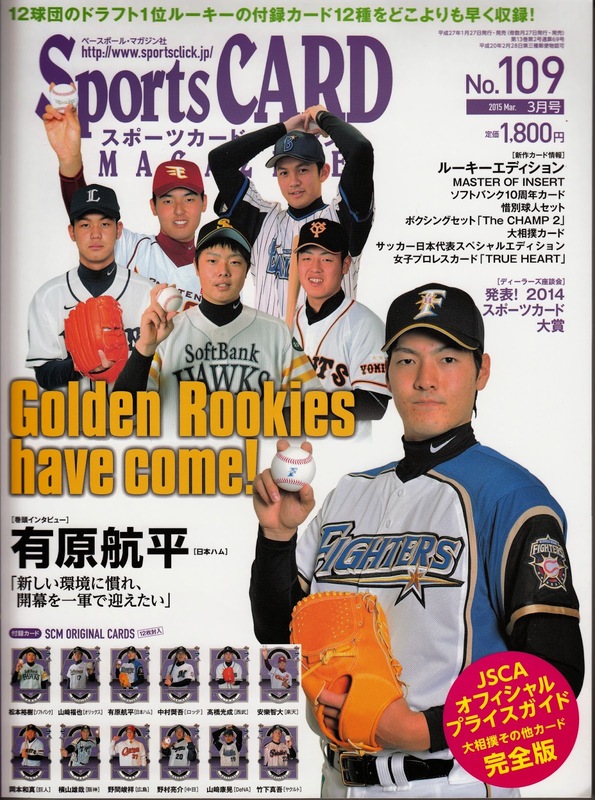 ISMAC had been founded in the early 1980's by Marty Kuehnert, who is one of the names that constantly appears when you read about Japanese baseball. 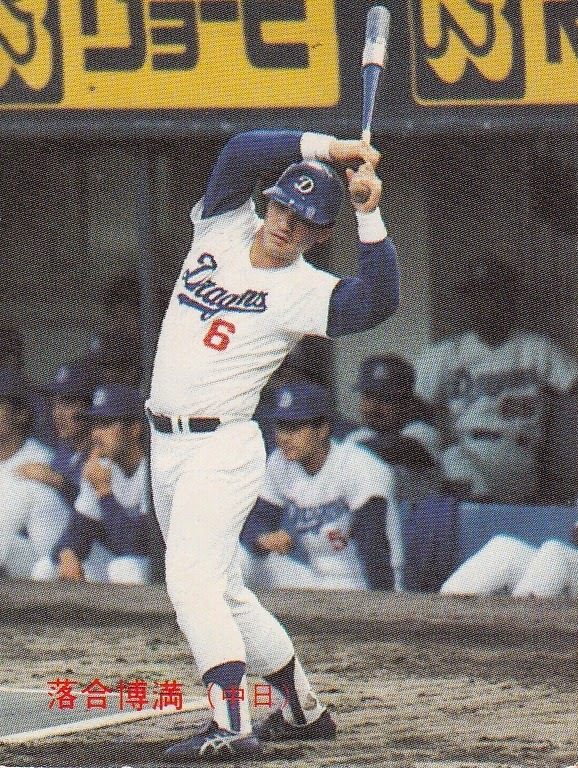 Kuehnert got his start working as the business manager of the Lodi, CA team in the California League when it was owned by Nagayoshi Nakamura who stocked it with players from the Orions in 1972 and Lions in 1973 (According to Robert Obojshi’s “The Rise of Japanese Baseball Power”, Nakamura was the owner of the Lotte Orions in 1972 but he sold his “controlling interest” in the team prior to 1973 when he bought into the then-Nishitetsu Lions). He went on to be director of sales and promotions for the Lions in the mid-70’s and handled licensing for Descente (a sportswear company in Osaka) before starting ISMAC. 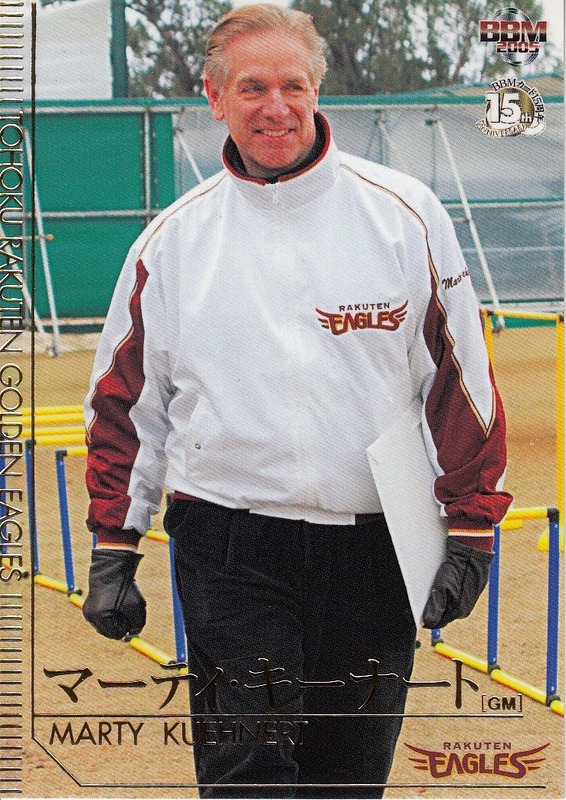 Kuehnert would go on to be the President of the Birmingham Barons in the early 1990's and was the first GM of the Tohoku Rakuten Golden Eagles in 2005. He has also hosted a TV sports talk show, run a restaurant, wrote a couple newspaper columns for the Daily Yomiuri and the Japan Times and has published seven books in Japan. As of 2011 he was teaching classes at both Sendai and Tohoku Universities (he was also vice-president of Sendai University). 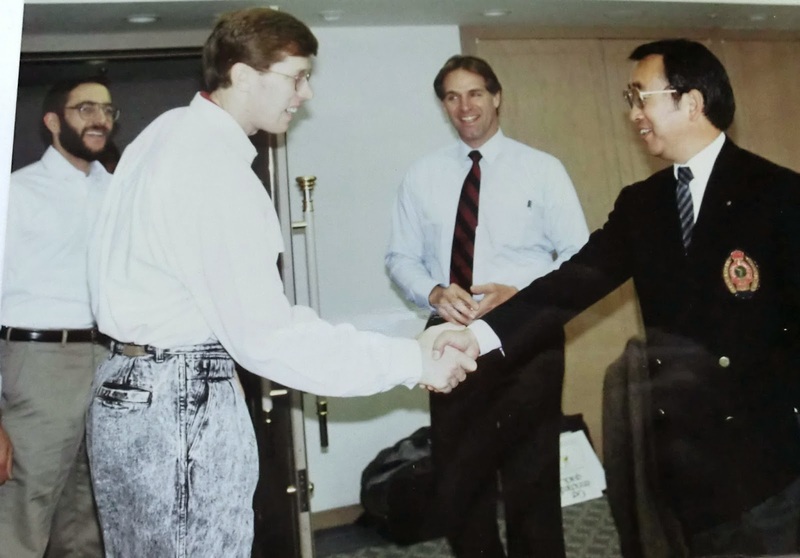 Like many before and after him, Fuhrmann had come to Japan in the early 80's to teach English. "I moved to Japan to teach English in 1982. I met Marty Kuehnert in 1983 at the bar he owned in Kobe. I went back to San Francisco in 1986 and worked for Yamato Transport but was not satisfied with the work. I mentioned to friends in Japan that I wanted to move back there. I met Marty in [San Francisco] in March of 1988 when he was on a business trip and he told me that he was going to open the first Sports Bar and Restaurant [in Japan] in the summer/fall of that year. He asked me to be the manager and I agreed and moved back to Japan in June. Originally, The Attic Junior (his original bar was called The Attic) was going to be open for lunch and I was to work a regular 9 to 6 shift. But the lunch business didn’t work out so we quit that and I found myself working from 5 until 1 am or later. With 2 young boys (age 1 & 3) it was less than an ideal family situation (and not much sleep for me) so I asked Marty if I could work at ISMAC on a regular 9-5 shift instead and he agreed." 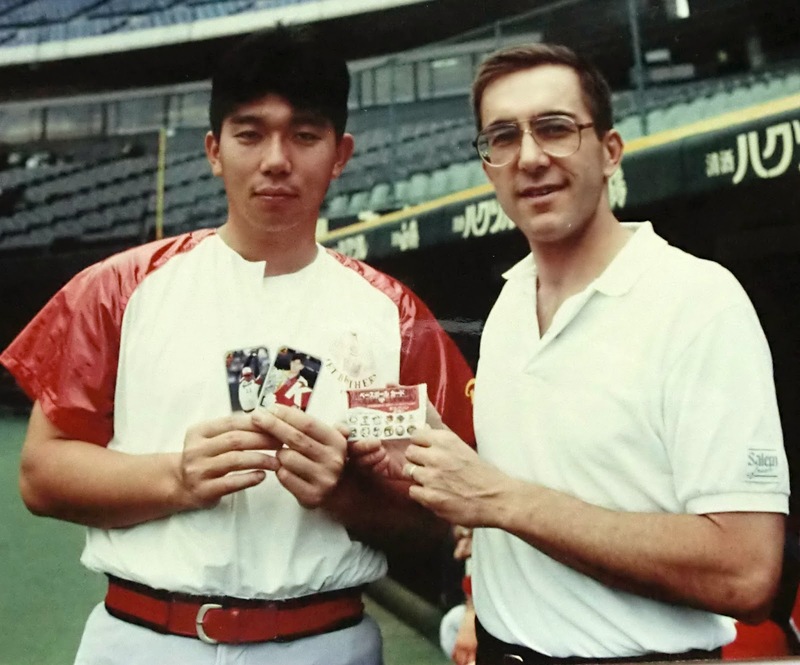 His duties with ISMAC included office work, writing the Japanese Baseball Newsletter (sponsored by Mizuno and sent to foreign players) and doing both play-by-play and color broadcasting for English language baseball telecasts for Kansai TV. Fuhrmann had quite a daunting task. There was no organized baseball card collecting hobby in Japan in 1988. "Marty told me to find out as much as I could. I went out and bought samples of what was available which was not much, just Calbee Chips cards and Takara game cards which came in team sets. I found out that cards were not sold in packs like Topps, Donruss, Fleer and Score cards were in the States. Then I started researching the history of card collecting in Japan [and] bought all the examples of old cards I could find, including menko and bromides." Fuhrmann was able to find the current cards by going “to toy stores and local corner stores called dagashiya” but finding older cards was much more difficult. He related some of the obstacles in a 1990 interview with Rich Marazzi in Sports Collectors Digest: "The first 15-20 people I asked, they didn't understand the concept of a baseball card. 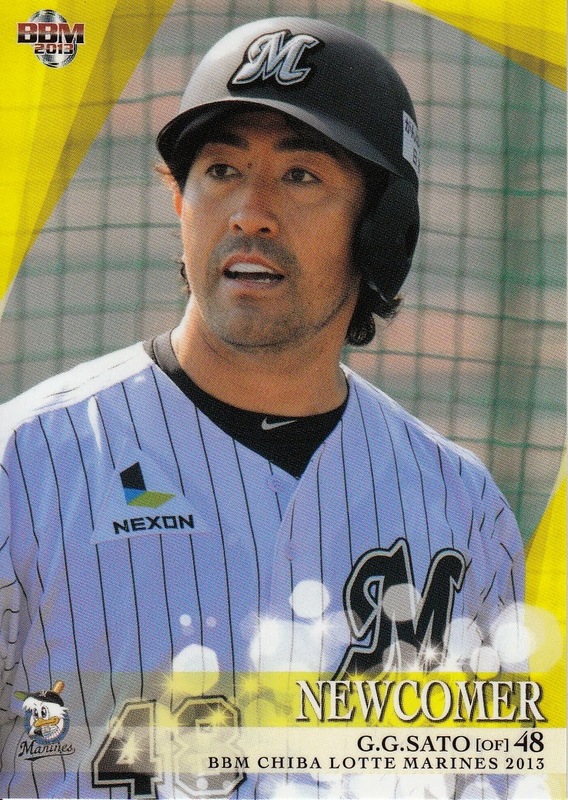 The older people know about Menko and Menko is now among some people a collectors item...There's nothing written about Japanese baseball cards, certainly nothing that I know in English. When I began my research I found one article in a 1982 issue of a magazine called Number. The article was about Kobai Caramels. All the information I've gotten is from talking with people...Another problem is that Japan is a small and crowded country. In the cities the living quarters are very small and there are no basements or attics where people would store their collections and rediscover them in 10-15 years." With (obviously) no card shops, he hunted the older cards wherever he could: "I frequent flea markets, old bookstores and antique shops" he related in a second interview with Marazzi in 1991. Along the way he developed a network of other collectors, both in Japan and the US. 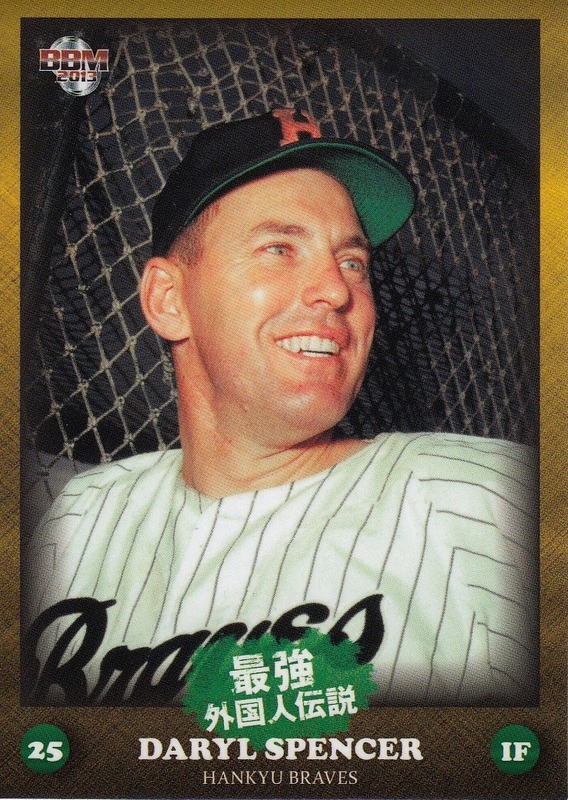 “We contacted the Baseball Hall Of Fame (at Korakuen) in Tokyo, but they couldn’t tell us anything about baseball cards in Japan.” Fuhrmann told the Kyodo News Service in 1989. In fact, I’ve heard that they’re directing requests for information about Japanese baseball cards to us”. One of the most fascinating aspects of Fuhrmann's research was his relationship with Calbee, which started in early 1989. "I contacted Calbee to inquire about their card history, to see if they had a master checklist (they did not) and asked if they had leftover stock of old cards (they said they didn’t)." He made a visit to Calbee's Tokyo office and met with the employee in charge of their baseball cards. "He didn’t have a clue about cards or collecting. He was probably around 25 or so. 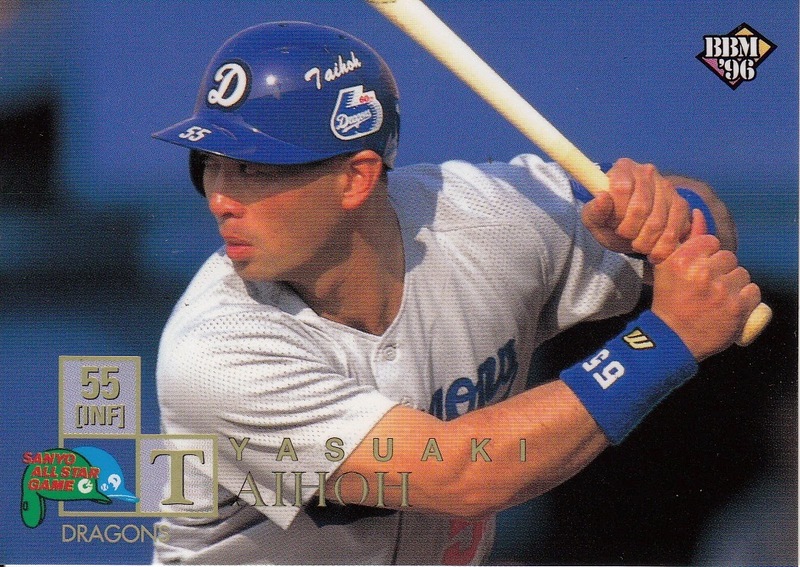 There was no consistency to Calbee baseball cards because a new guy took over the job every other year or two. I tried to impress upon him/them how big the hobby was in the U.S. So finally I suggested that we go to the States and I would show them around so they could see with their own eyes. I was going back to [Connecticut] (I was born and raised in Danbury, CT) on vacation to visit my parents so I suggested they come at that time. So 2 guys from Calbee came to meet me...and I took them to a card show, card shops and down to the Score company which was located in [Connecticut]." After that, Fuhrmann began a consulting relationship with Calbee, making occasional suggestions to them. 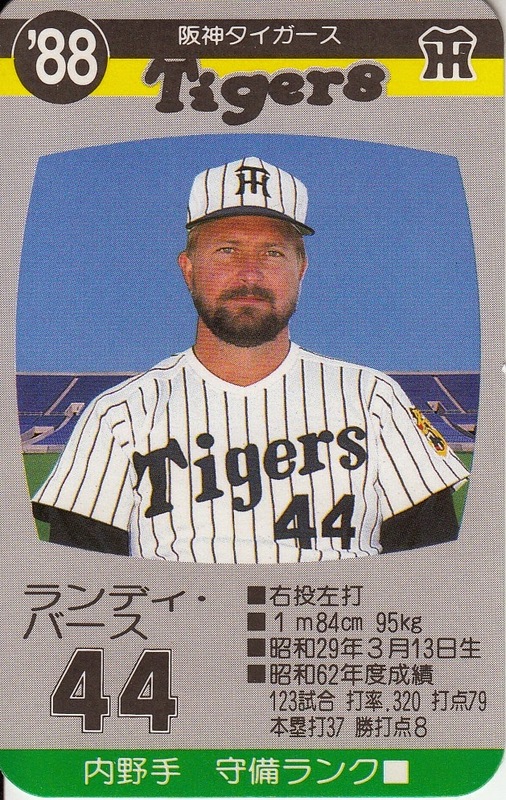 "Through my urging in 1989 Calbee began printing the name of the Japanese player in Roman letters on the card, so Americans could at least read the name" he told Marazzi in 1990. Calbee did not follow all of his suggestions however: "The biggest thing I tried to get them to do was have rookie cards of highly touted players just out of high school, college or the corporate leagues. 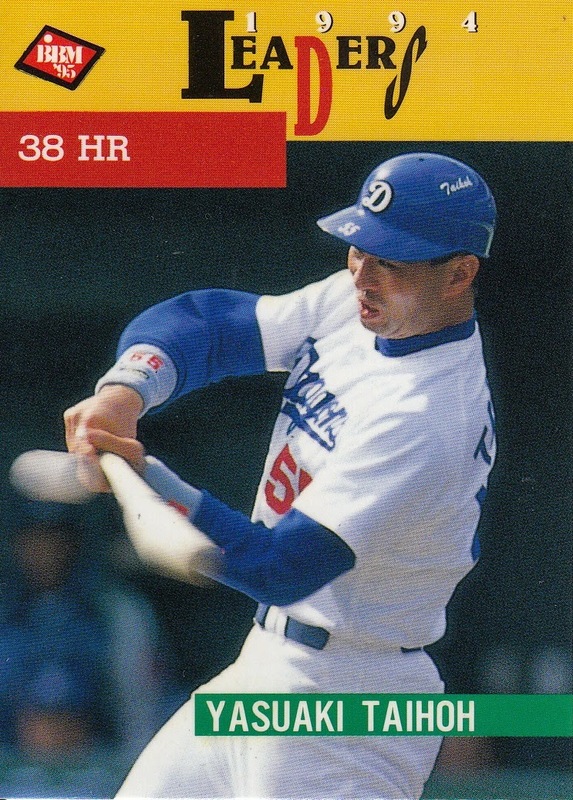 One specific guy was Hideo Nomo. 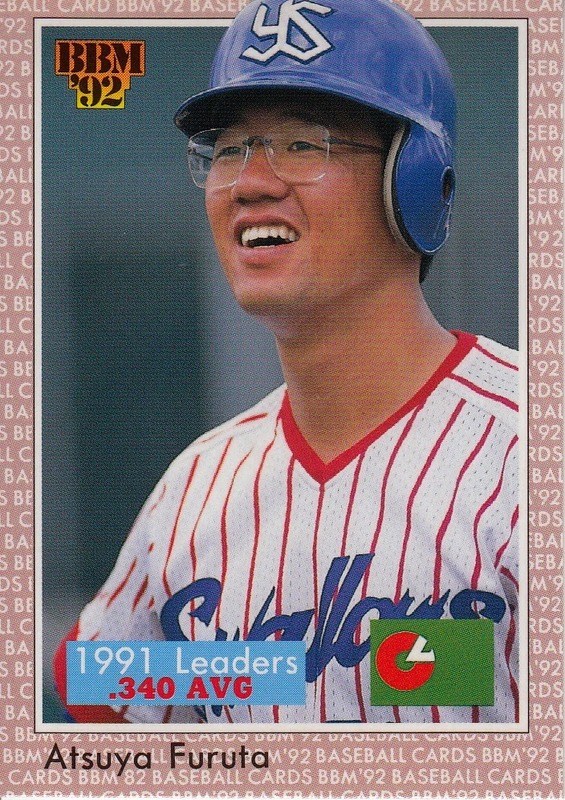 His first year was 1990 but Calbee didn’t make a card of him that year. They told me that the Kintetsu Buffaloes (and pro teams in general) wouldn’t allow them to. The mentality at the time was that rookies had to earn their stripes. Veterans who had paid their dues deserved it more." 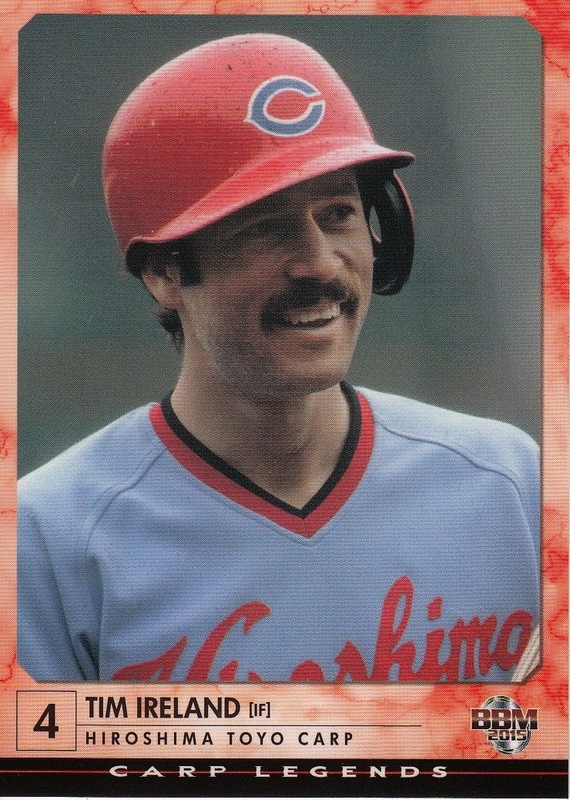 By mid 1989, Fuhrmann and ISMAC had gathered quite a collection of Japanese baseball cards. “[Marty] and I decided that since we had gone out and collected as many old Japanese cards as we could, we decided to see if we could sell any” he told Marazzi in 1990. They decided to organize a card show, the first ever in Japan. The show was held on September 3, 1989, at Kuehnert’s Attic Junior restaurant in Kobe. It featured both American and Japanese baseball memorabilia for sale. Guests included Daryl Spencer, who had played seven seasons with the Hankyu Braves in the late 1960’s-early 1970’s and Boomer Wells, who was at that time a star for the now-Orix Braves. Somewhere between 100 and 200 people attended, traveling from as far away as Kyushu and Tokyo (and reportedly at least one collector from Southern California). 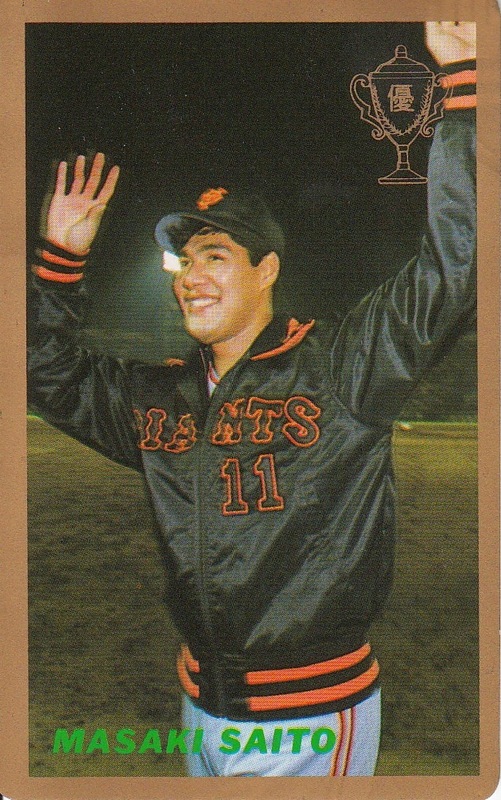 Fuhrmann was quoted in a 1990 Baseball Card News article on the show as saying that the crowd was estimated to be 15% Americans who accounted for 35% of the sales. The American collectors were reportedly most interested in Japanese items while Japanese collectors were more interested in American items. By all accounts, the card show was a rousing success. 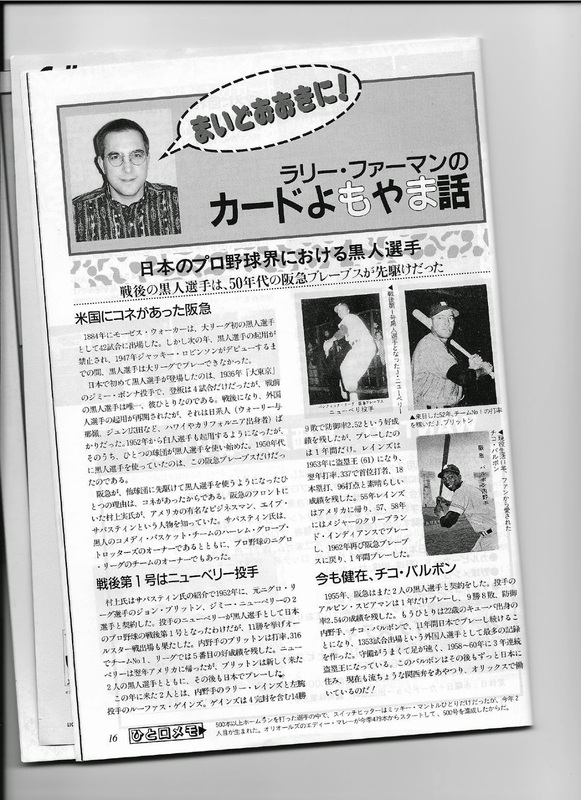 ISMAC followed up with a second show in Kobe in 1990 and a show in Tokyo in 1991. By that time, however, ISMAC had moved into a whole new arena. Fuhrmann would be instrumental with the new line of cards. “When [Baseball Magazine SHA] finally decided to go ahead with the project, I moved up to Tokyo in 1991 to supervise everything. No one [there] had a clue about card collecting. They were book and magazine publishers. So just about everything [they] did with their cards was at my instruction. 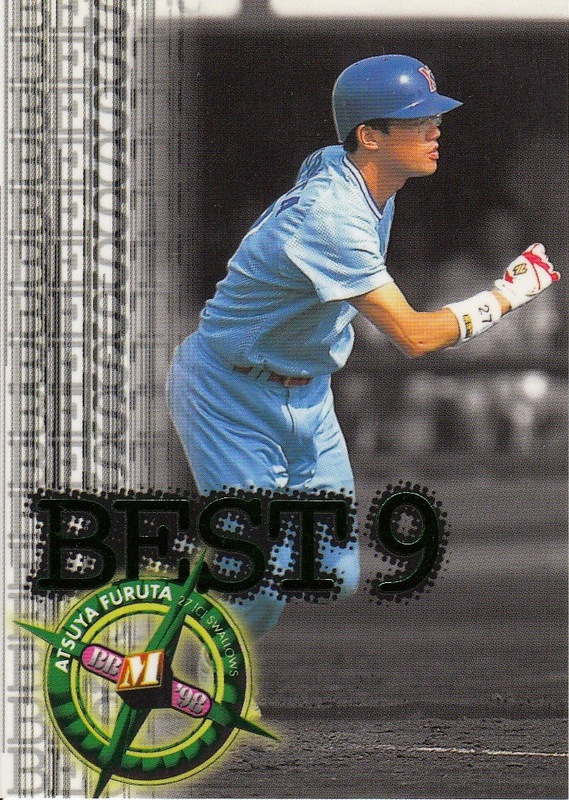 I am the person who came up with the name BBM, decided what would be put on the backs of the cards, was adamant that rookies be included [and] pushed for Oh, Nagashima and other greats from the past be included [in the “Nostalgic Stars” subset]”. It was also Fuhrmann’s idea to include a subset featuring the statistical leaders and award winners from the previous season. 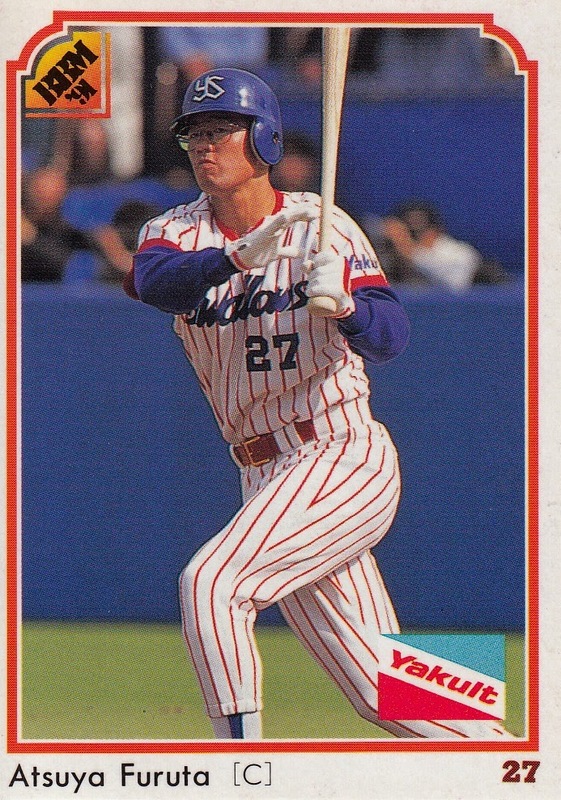 The inaugural 1991 BBM set would include many other features that were common to American baseball card sets but were unheard of in Japan at the time. Cards were issued in 10 card foil packs with no food product - most other card sets had been issued with only one to three cards in a pack and almost always associated with a food product (Calbee with potato chips, Lotte with gum, etc). The back of BBM’s player cards featured vital statistics for the players (birthdate, height, weight) as well as the player’s complete career statistics. Other than the language, the backs could have been from a Topps set. 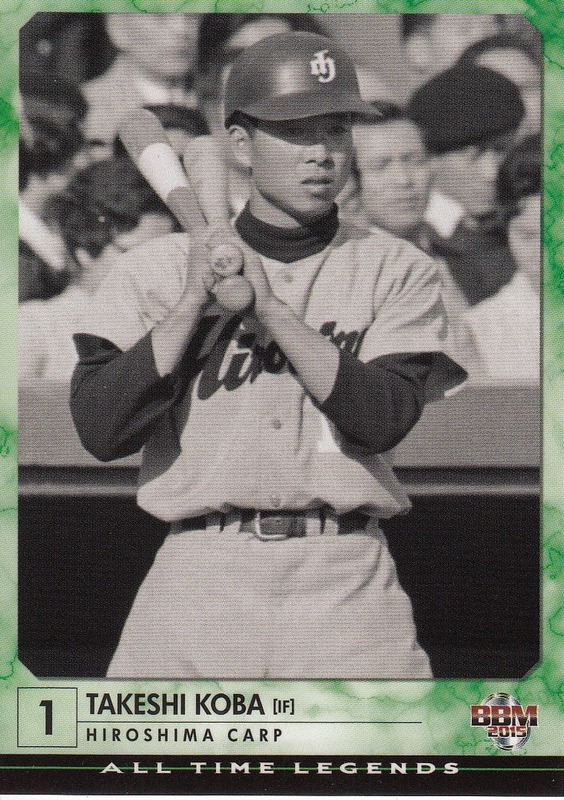 No other Japanese card set (with the exception of the 1967 Kabaya-Leaf set) had ever had backs like that. BBM also sold factory sets, another first for Japan. I want to thank Larry Fuhrmann for graciously allowing me to interview him over email and being patient while I s-l-o-w-l-y put all this together (I've been working on this for the better part of a year). And I need to thank him for the photos he sent as I was finally preparing this to be posted. I also want to thank Paul Margiott for providing me with the scan of Larry's SCM article as well as selling me a whole bunch of 20+ year old clippings, Ralph Pearce for suggesting that I contact Larry because he had an interesting story to tell and my wife for her help in editing this post. Sports Card Magazine #109 hit the newsstands Tuesday and I received my issue today. This is probably the third issue in a row that is of limited value to the non-Japanese reading so I may start seriously reconsidering if I want to keep getting these (or finally start trying to learn to read Japanese). I'll do a quick run down of the issue - the color section has an interview with newly drafted Fighters pitcher Kohei Arihara (formerly of Waseda), a two page article (plus a two page ad) for the upcoming Rookie Edition set, a two page ad for the new 2015 Sumo set, full page ads for the Master Of Insert, Softbank 10th Anniversary, Japan National (Football) team, and the True Heart women's wrestling sets and half page ads for the "Retirement" set and "The Champ" boxing set. There's not a whole lot I recognize in the "newsprint" section of the magazine. There's the usual checklists for the upcoming issues and checklists and price guides for the 2014 and later issues for all sports. The magazine has a rotation for the older checklists and this issue has checklists for sumo and "other" sports (Japan Basketball League, bowling, Real Venus, etc). Continuing with what they did last year, this issue includes 12 baseball cards. All 12 are promo cards for the upcoming Rookie Edition set. Having 12 cards works out nicely as it allows them to include a card of the top draft pick for each of the 12 teams. 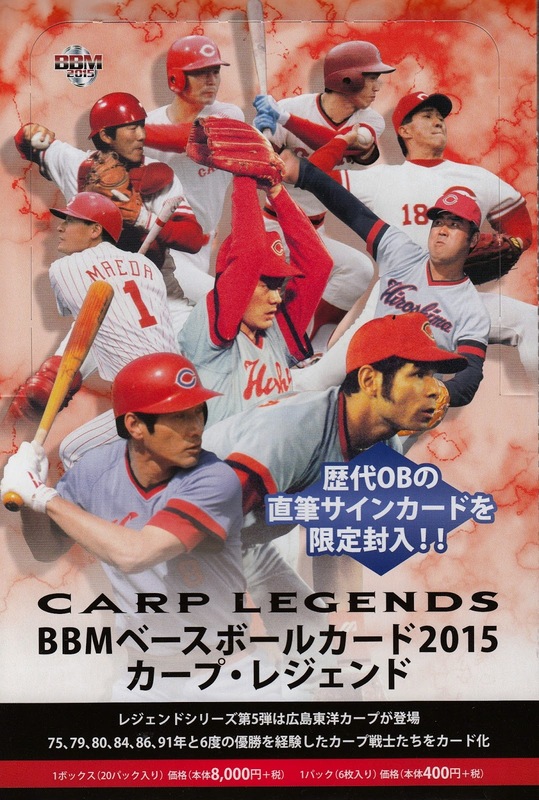 The latest in BBM's OB team set "Legends" series is for the Carp and was released just about a month ago. The theme of the set is the six Central League pennants and three Nippon Series championships that the Carp won between 1975 and 1991 (which by the way are all of the Central League pennants and Nippon Series championships that the Carp have won). If this theme sounds vaguely familiar to you, it's because Epoch put out a similarly themed box set last year. The set contains 81 cards - 72 of them are for the players and managers who were part of the team between 1975 and 1991. Like the Epoch set, this set contains most of the names you'd expect - Koji Yamamoto (who actually has two cards - one as a player and one as the manager of the 1991 team), Sachio Kinugasa, Manabu Kitabeppu, Yutaka Ohno, Yoshiro Sotokoba, Kenjiro Nomura, Tomonori Maeda and Shinji Sasaoka. Unlike the Epoch set, it has cards for foreign players - Rod Allen, Mike Dupree, Adrian Garrett, Gail Hopkins, Tim Ireland, Jim Lyttle and Richie Scheinblum. These are the first BBM cards for Dupree and Ireland and Allen's first BBM card since 1991. The seven foreigners are about a quarter of the players in the BBM set that are not in the Epoch set. Since the Epoch set only had 48 player cards, you'd expect that there would be 24 players in the BBM set that aren't in the Epoch set. 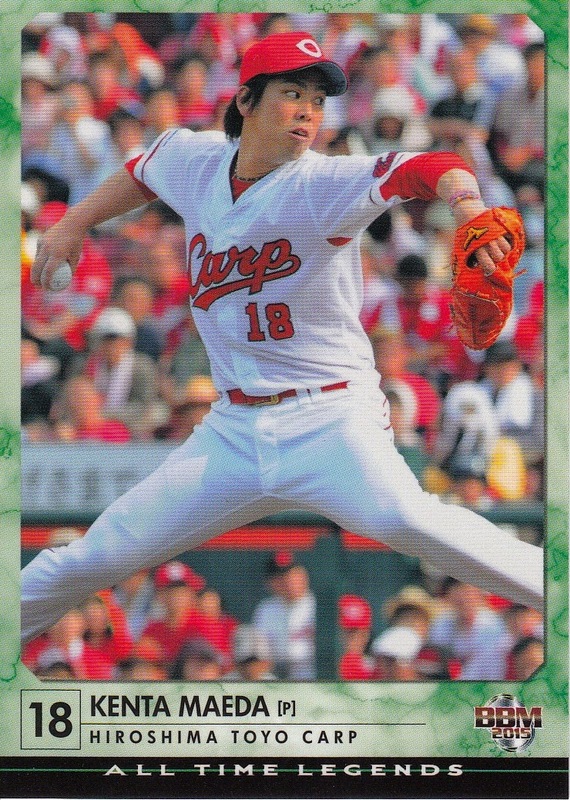 There's actually 28 (29 if you count the extra Koji Yamamoto card). Besides the gaijin players, the biggest names in the BBM set that aren't in the Epoch set are Akira Etoh and Kozo Shoda. There's five players in the Epoch set that aren't in the 72 card subset of the BBM set (although one is in the other subset). The biggest name of those players is Yutaka Enatsu. 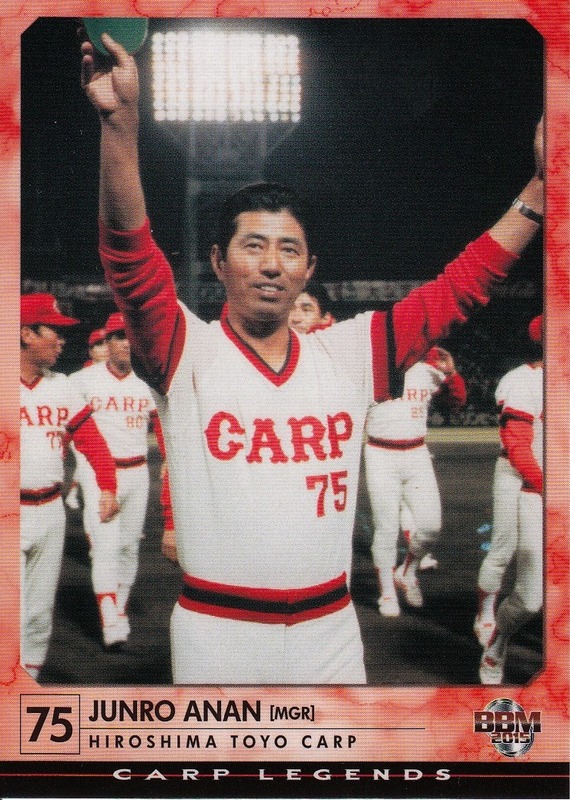 The remaining nine cards of the set are for the Carp's "All Time Legends". Despite being a nine card subset, this is not an "All Time Best 9" for the Carp. 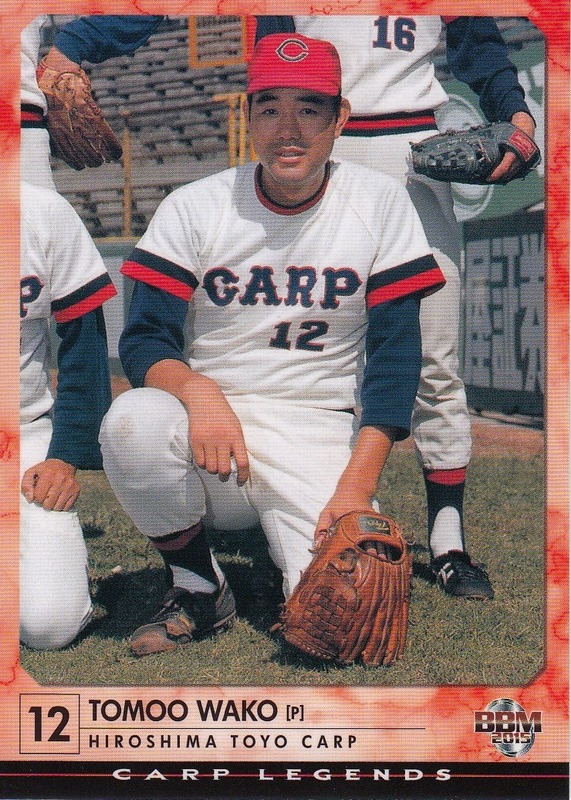 It simply contains a number of star players from the Carp from the years other than 1975-1991. The players are Sohachi Amiya (who was in the Epoch set), Hiromi Fujii, Ryohei Hasegawa, Tomoaki Kanemoto, Takeshi Koba (who's in the other subset as a manager), Makoto Kozuro, Hiroki Kuroda, Kenta Maeda (the only active 2014 NPB player in the set) and Katsumi Shiraishi. It's a nice looking set as the Legend cards go. Most of the photos are in color and there's a decent variety in the poses. You can see all the cards at Jambalaya and judge for yourself. BBM announced a couple of new sets this past week, each of which caught me by surprise. - I suppose I shouldn't have been surprised that BBM was putting out a Softbank 10th Anniversary set but I was, especially since I would have thought that such a set would have come out last year. (Softbank bought the Hawks from Daiei following the 2004 season so 2015 is actually the 11th year Softbank has owned the team. 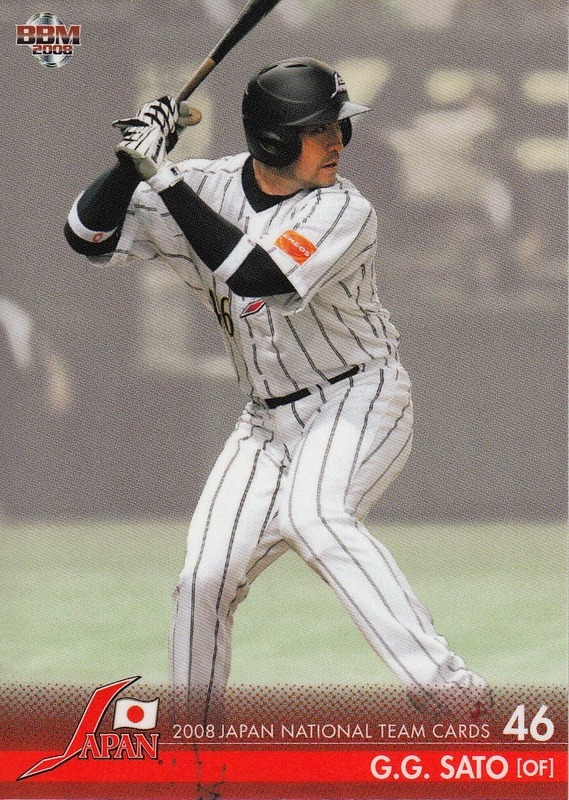 The Eagles started in 2005, the first year Softbank had the Hawks and their 10 year Anniversary set was last year.) Anyway, it looks like it's pretty much a run-of-the-mill OB team set. 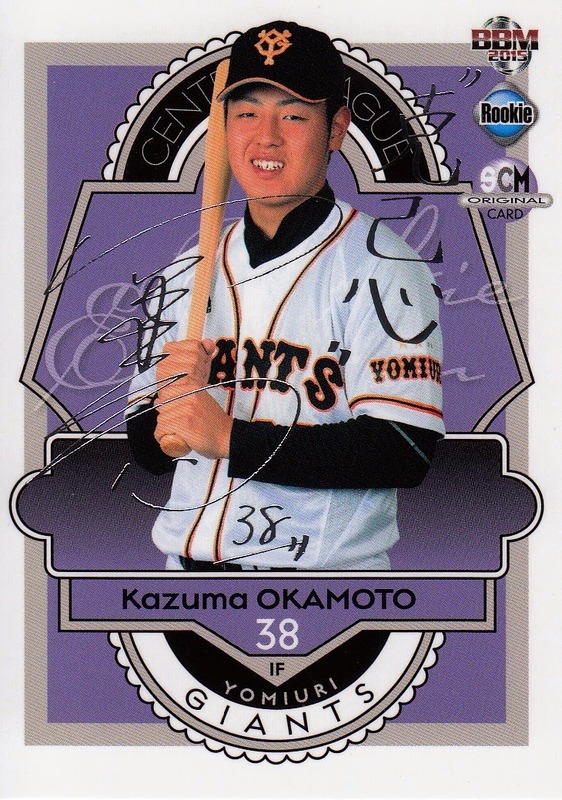 The base set is 81 cards which breaks down to 63 OB players, 9 active players (don't know if that's a "Best 9" or not) and 9 "highlight" cards (which apparently includes a card for the signing this off season of Daisuke Matsuzaka). There's a nine card "Best 9 Of The Decade" insert set and the usual assortment of autograph cards available. The set will be out in late February. - The other set BBM announced last week simply surprised me with its audacity. The new "Master Of Insert" set is a pack based set that features a base set of 55 cards - 54 cards of OB players plus a checklist card. Each of the cards of the players is limited to (and I assume serially numbered to) 75. There are three separate 18 cards insert sets - Elite Nine, 3d Royale and Jet Black. Each of the insert cards is serially numbered to 25. There are three different types of authentic autograph cards availabe - Master Of Auto, Hall Of Fame and Neo Legend. What really gets crazy on this set is the price - BBM is recommending a 15,000 yen (roughly $127 at today's exchange rate) per box (although Discount Niki is charging 16,200 yen or around $138). Each box only contains a single pack of cards. Each pack contains six (really five) cards - 3 base set cards, one insert card, one autograph card and one checklist card. There will be only 1350 boxes available (which makes sense if you do the math - 3 18 card insert sets limited to 25 a piece = 3 * 18 * 25 = 1350). Yu Darvish is one of the players in the set - this marks the first time he's made an appearance in a BBM set since he left for the US after the 2011 season. The set will be released in late February. I'll be interested to see how much of it Jambalaya is able to display on their website. When the Hall Of Fame election results were released the other day, it turned out that former Yomiuri Giants pitcher Masaki Saitoh had missed the cut by only three votes. 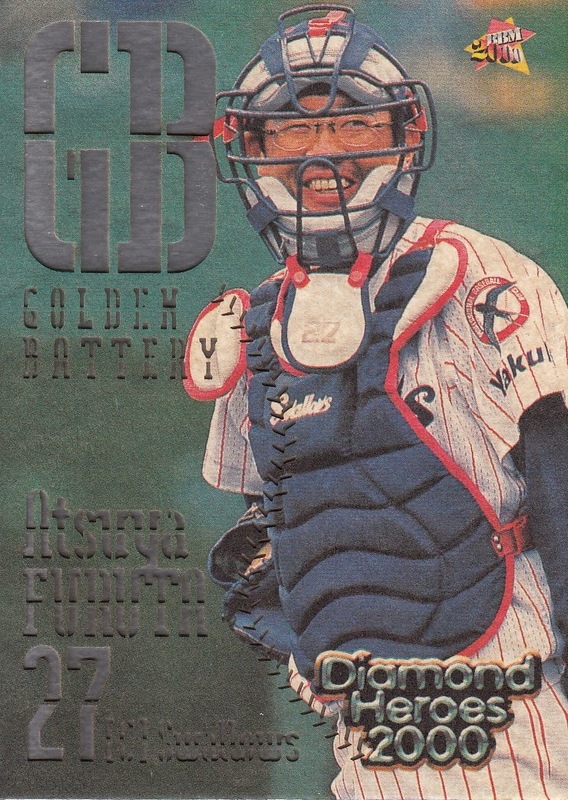 The last 20 cards of so of the 1990 Calbee set (#196 to 217) featured gold borders. 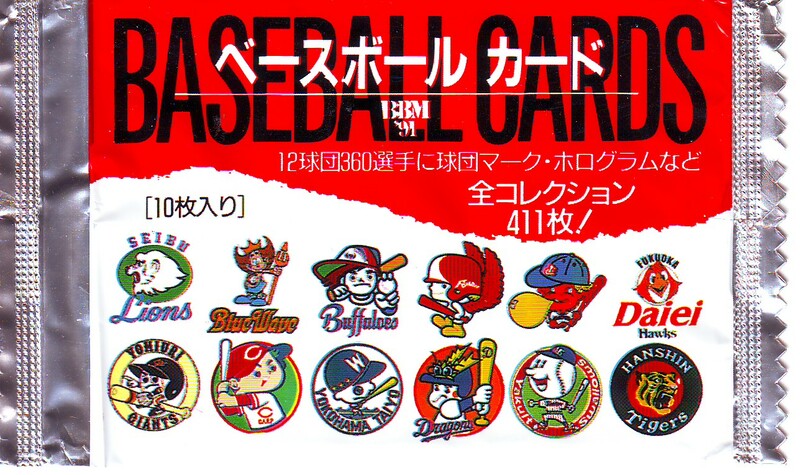 According to the Calbee collector web site, it looks like these cards only featured players from the two 1990 Nippon Series teams, the Giants and the Lions. 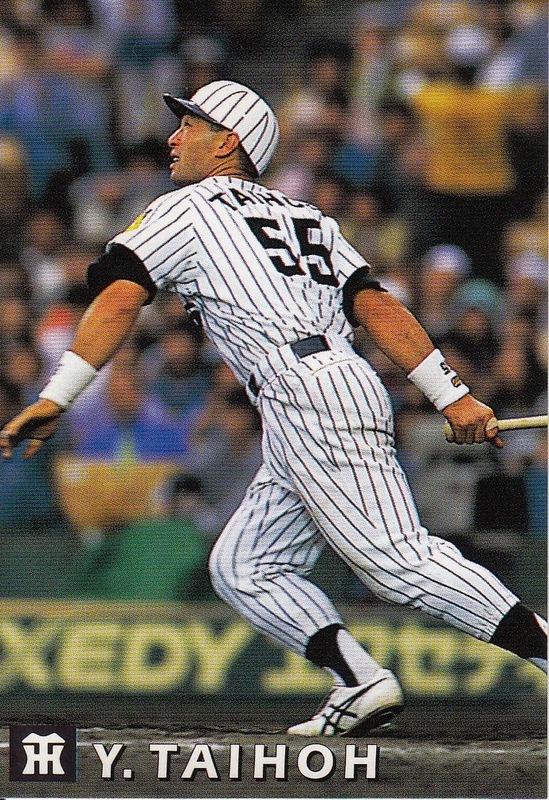 Former Kintetsu Buffaloes pitcher Takashi Imoto passed away from pancreatic cancer at age 64 this weekend. 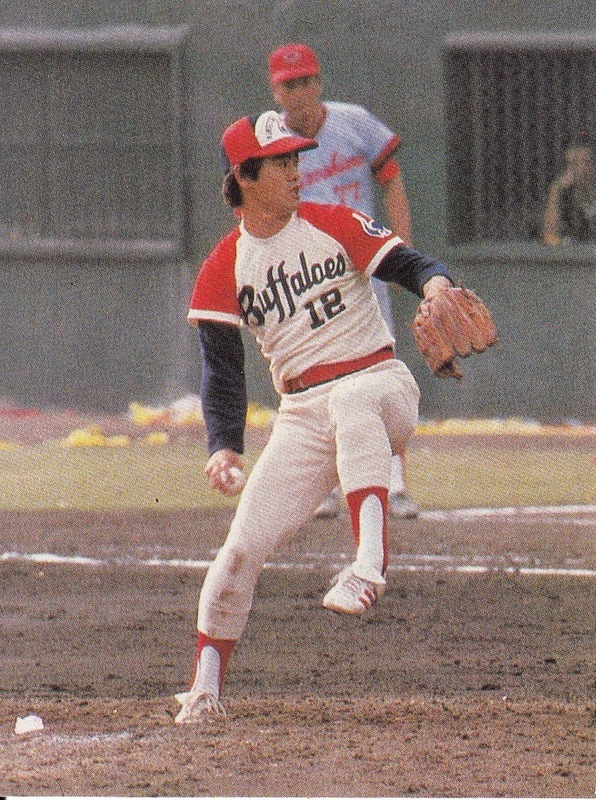 Imoto spent 10 seasons with the Buffaloes from 1973 to 1982 and then finished his playing career with the Swallows (1983-84). 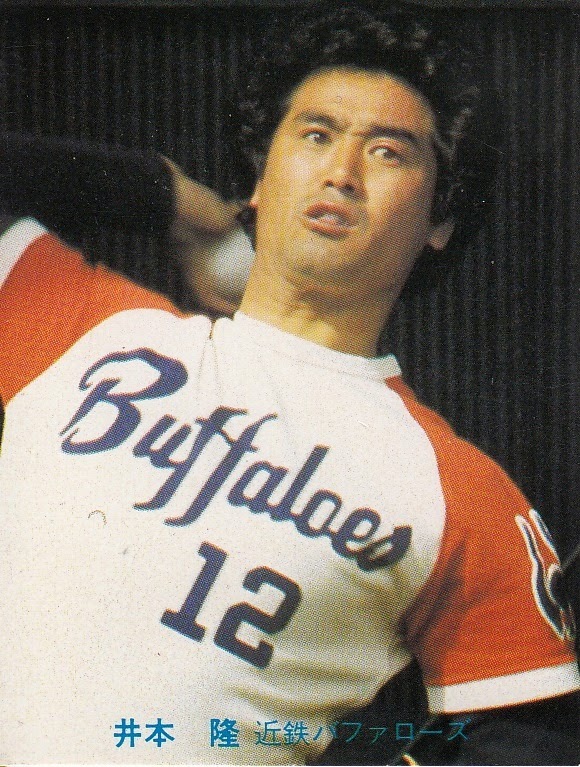 Probably his biggest claim to fame was winning two games for the Buffaloes against the Carp in the 1979 Nippon Series, a Series that the Buffaloes ultimately lost. He won the "Fighting Spirit" award for that Series, which is kind of an MVP for the losing team. I don't have many cards of him, only a couple of Calbees from the late 70's and early 80's. 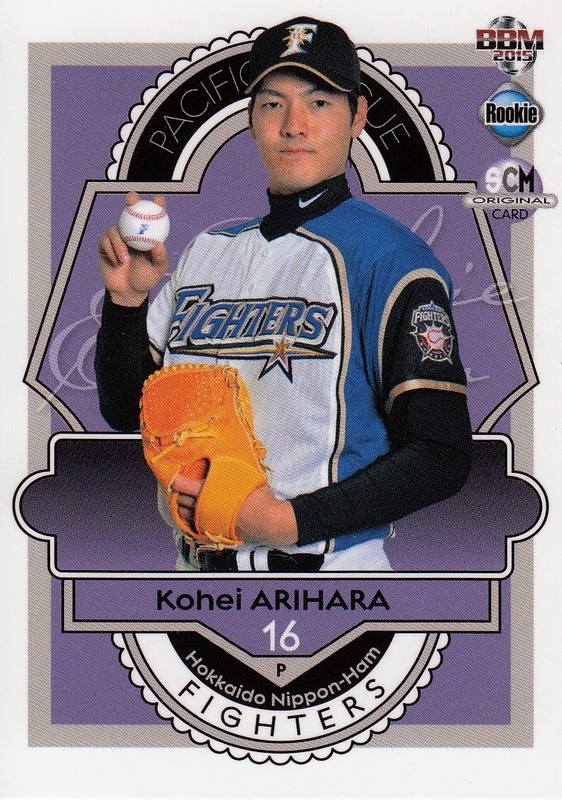 He's shown up in a couple of BBM's OB sets dedicated to Kintetsu - the 2009 Kintetsu Memorial set, the 2011 Legend Of the Bs set and the recently released Buffaloes Achievement set. 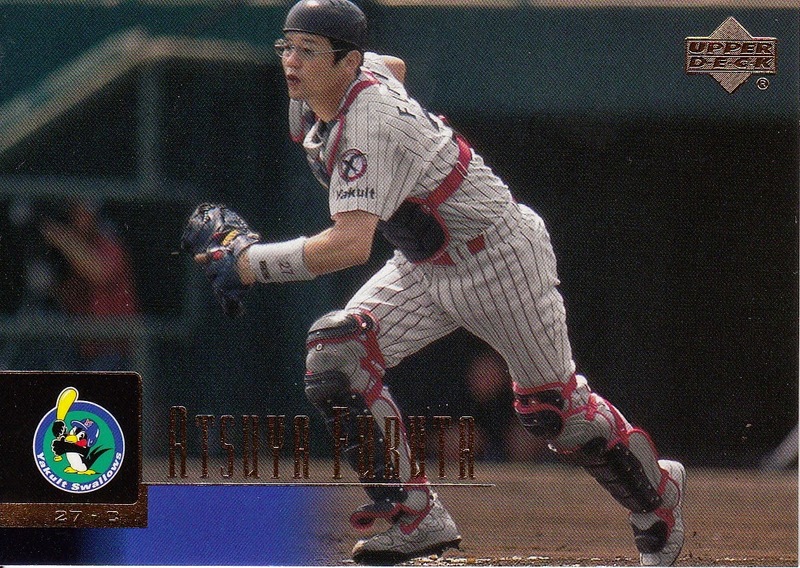 The 2015 Hall Of Fame class was announced yesterday and only one player was elected from the Players Division - Atsuya Furuta. 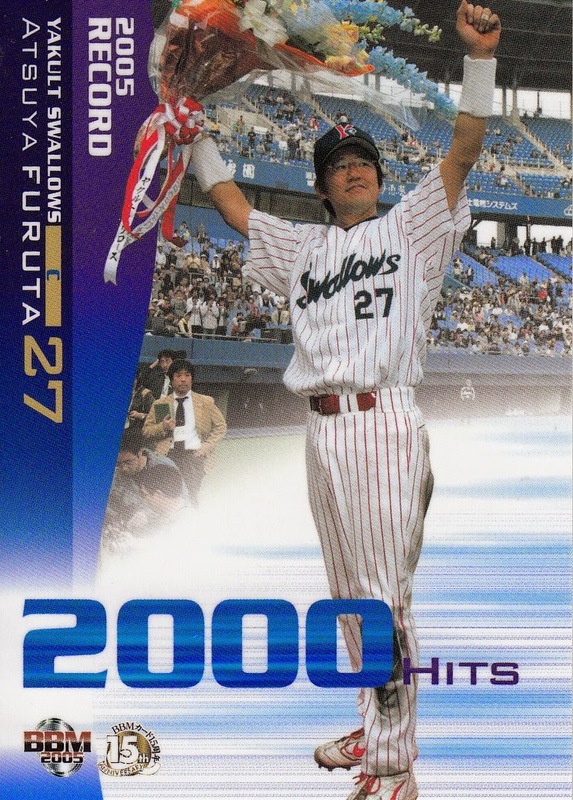 In past years, I've done a post for the Hall Of Fame inductees showing two or three cards for each player but since there's only one this year and since he's probably my favorite player that I've never devoted a full post to, I thought I'd go all out for Furuta. 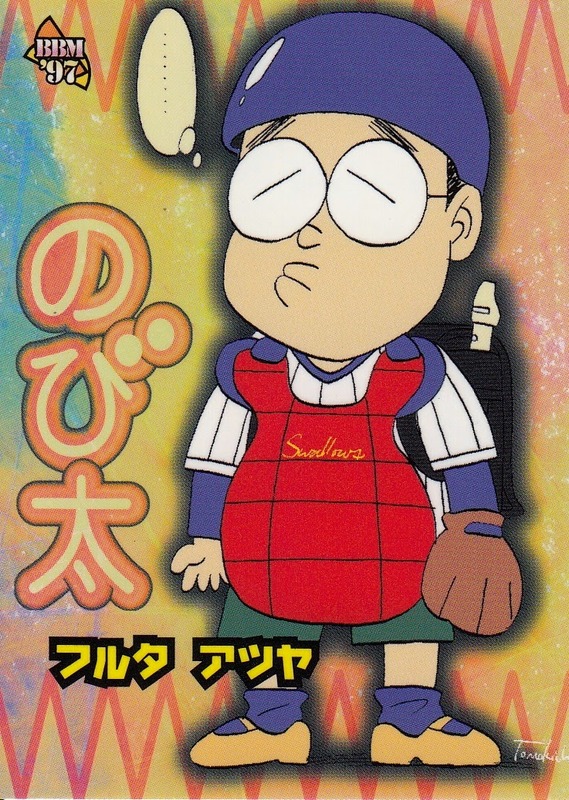 (When I first started collecting Japanese cards, there were three guys that I seemed to find in every set - Koji Akiyama, Kazuhiro Kiyohara and Furuta. I ended up becoming a fan of all three of them. I've previously done posts for Akiyama and Kiyohara but never Furuta). 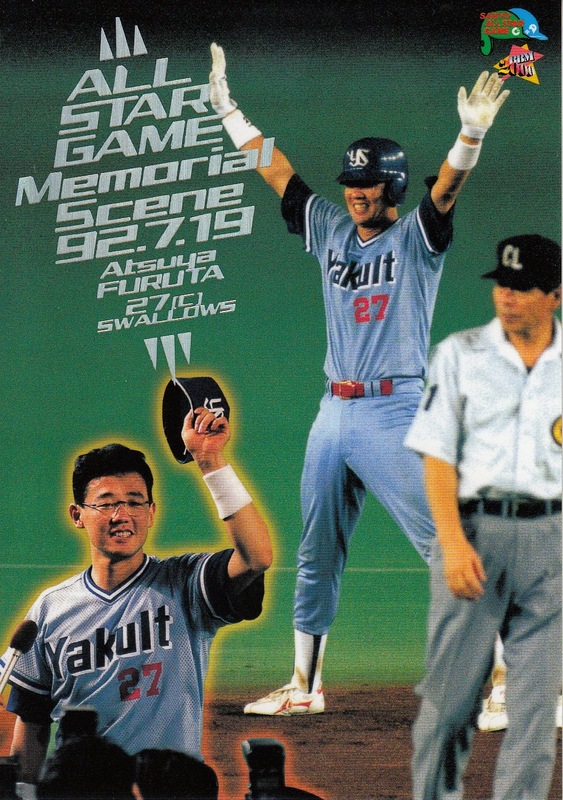 A Noburo Aota Fan's Notes had a very good write up of Furuta's career, so I'll just stick to the high points: he was drafted by the Swallows in the second round of the fall 1989 draft out of the industrial leagues and stepped into the starting catching role in his rookie year of 1990. 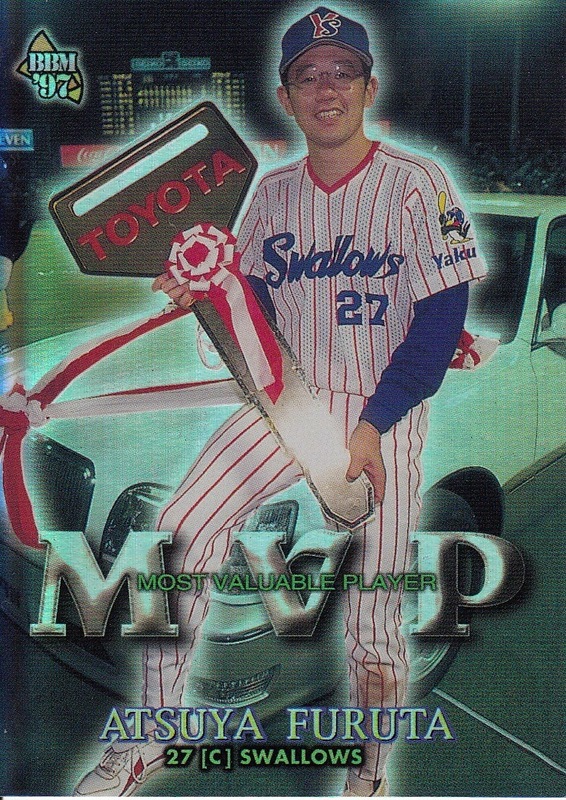 He remained with the Swallows for the next 18 years. 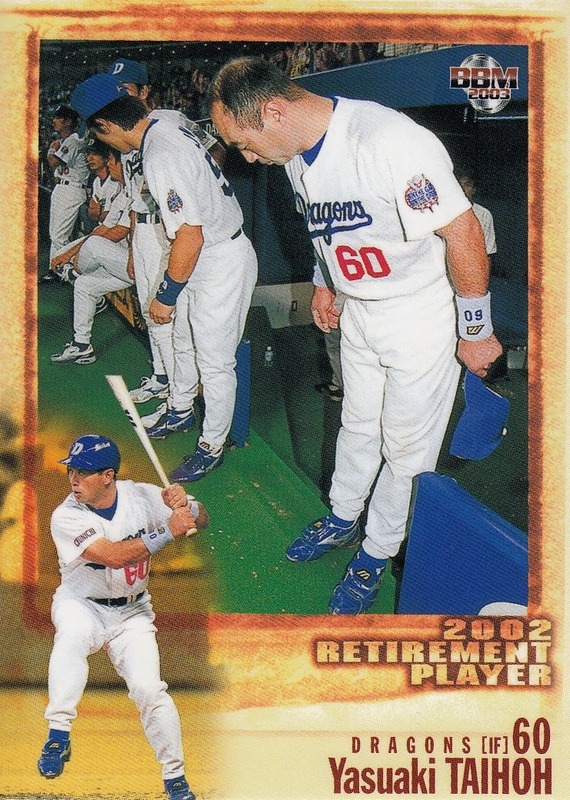 Sadly I have been unable to figure out what nickname his 1997 card is celebrating. 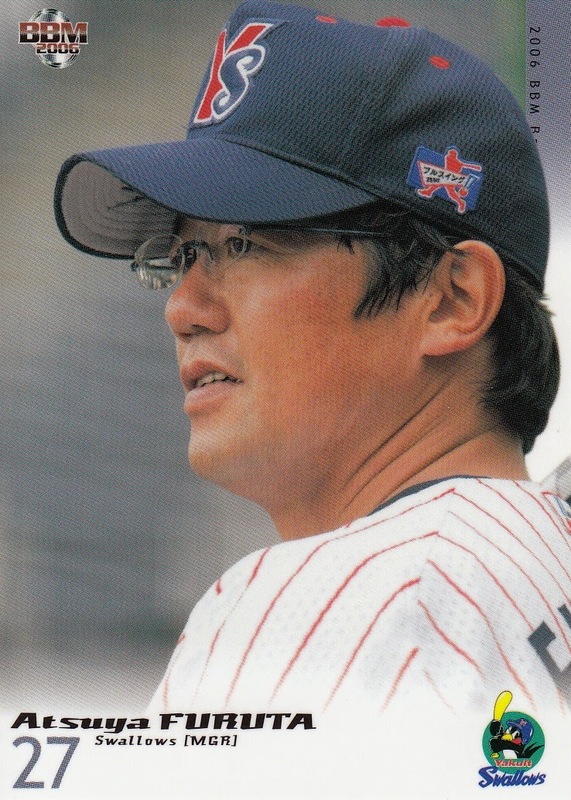 He was named manager of the Swallows prior to the 2006 season, becoming the first player-manager in NPB since Katsuya Nomura (Furuta's manager from 1990-98) in 1977. He managed the team for two years, retiring as a player mid-way through the 2007 season to concentrate on managing. (BBM issued two cards of him in both the 2006 and 2007 1st Version sets - one as a player and one as a manager). 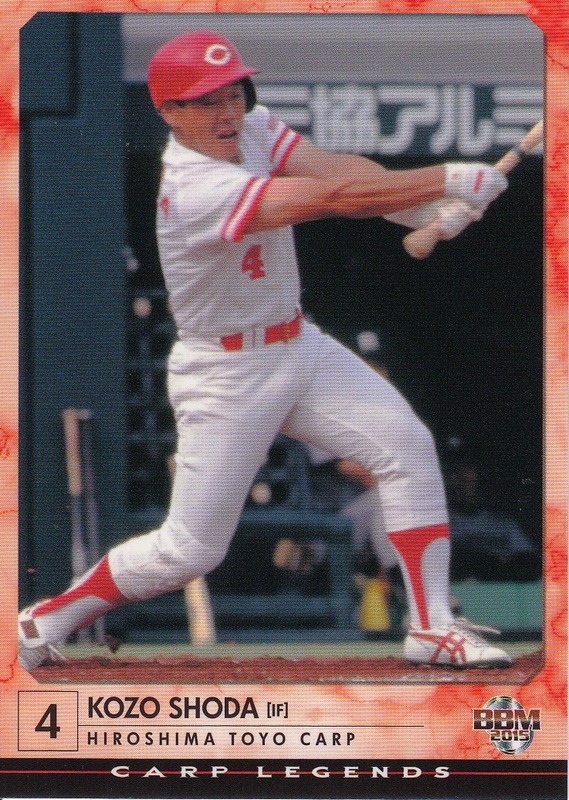 In his second season, he lead the Central League in batting, becoming (I believe) only the second catcher to ever win a batting crown in Japan (after Nomura in 1965. Shinnosuke Abe was the thrid in 2012). He finished his career with 2097 hits, good enough for inclusion in the Meikyukai. 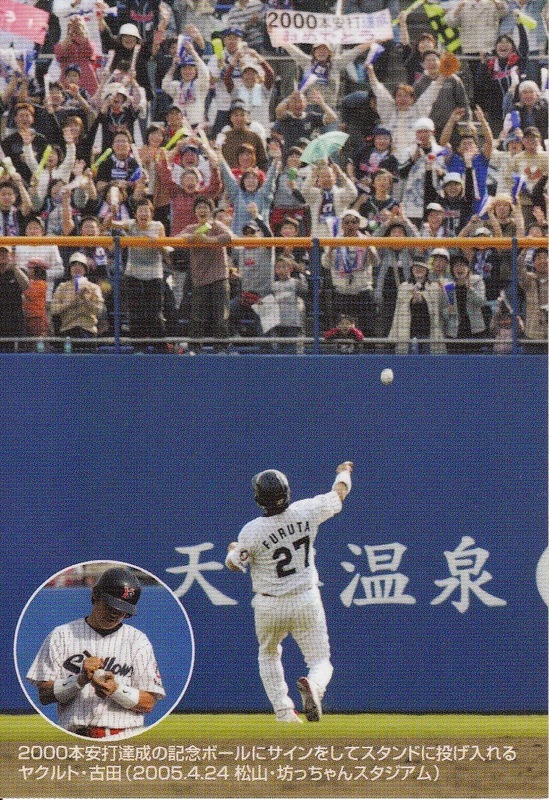 He got hit number 2000 on April 24, 2005 at Botchan Stadium in Matsuyama on the island of Shikoku. 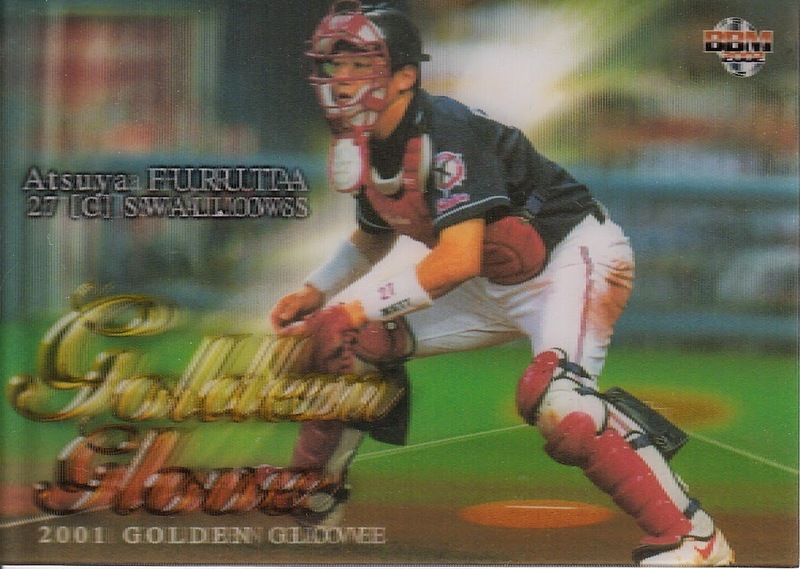 Furuta played in five Nippon Series with the Swallows - 1992, 1993, 1995, 1997 and 2001, winning championships each time except the first. He was the MVP of the Series twice - in 1997 and 2001. Winning two MVPs seemed to be a theme with him. 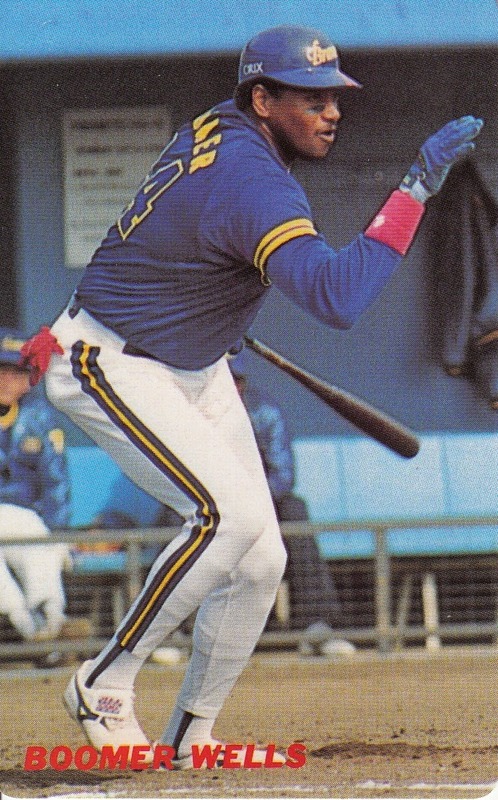 He won two Central League MVP Awards (1993 & 1997) and two All Star Game MVPs (1991 Game One when he threw out three base runners and 1992 Game 2 when he hit for the cycle). He ended up making 16 All Star teams (1990-2005 & 2007) in all. 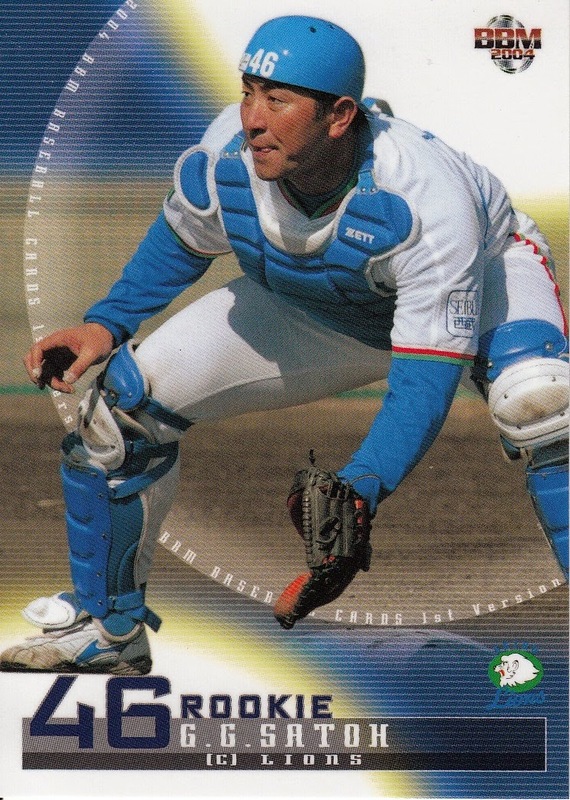 He was elected to the Central League Best 9 team nine times (1991 - 1993, 1995, 1997, 1999 - 2001, 2004) and was a 10 time winner of the Golden Glove award (1990 - 1993, 1995, 1997, 1999 - 2001, 2004). He also won a Shoriki Award in 1997 (back when they still awarded it to players). 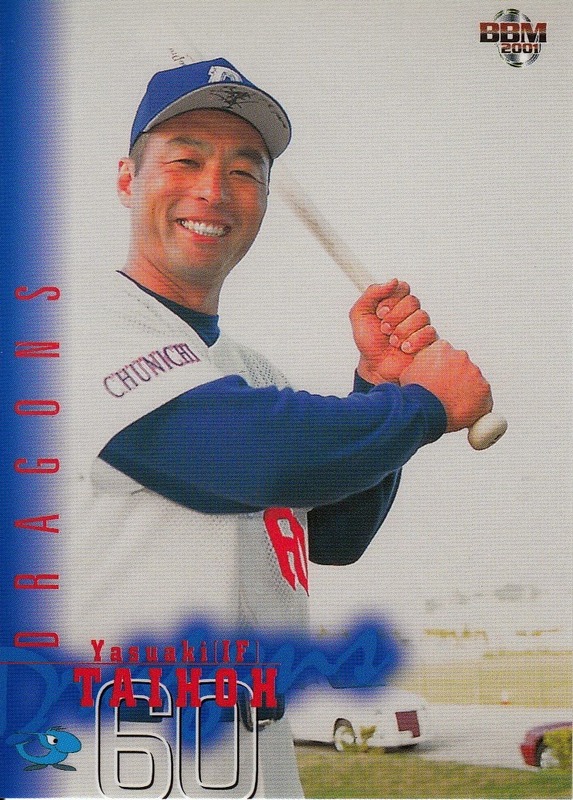 Former Dragons outfielder Ta-Feng Chen, who played under the name Yasuaki Taiho, passed away yesterday at age 51 from leukemia. 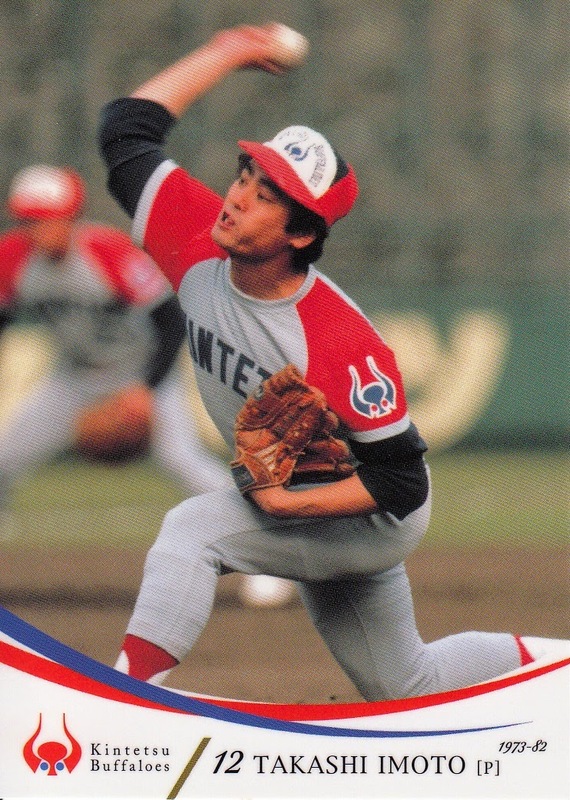 Chen was a Taiwanese citizen who attended college in Nagoya and (somehow) made himself eligible for the 1989 NPB draft (held in the fall of 1989) by working for Chunichi. 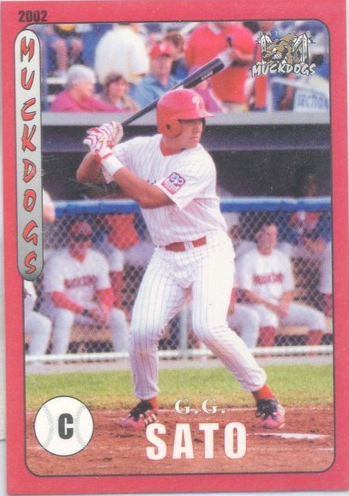 The Dragons took him in the second round and he played for them from 1989 until 1997, leading the Central League in home runs and RBI in 1994. He made three All Star teams - 1991, 1994 and 1996 and won a Best 9 Award at first base in 1994. 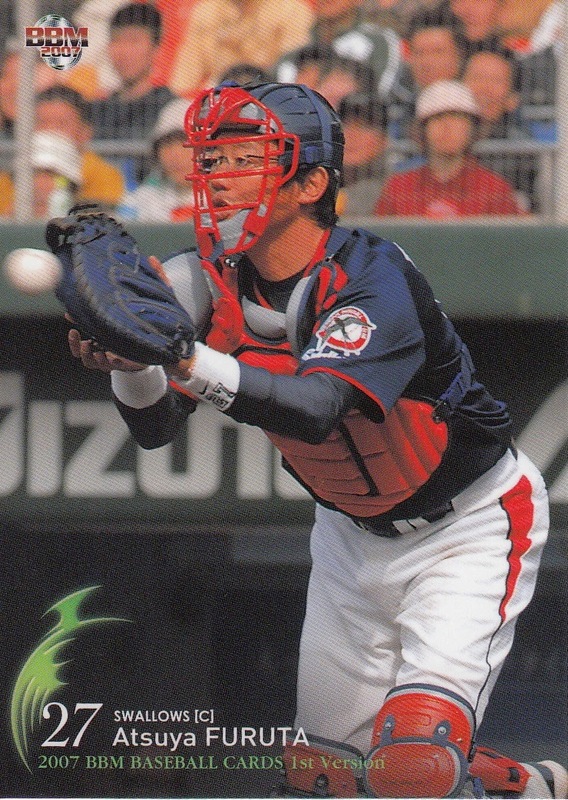 Following the 1997 season he was traded to Hanshin along with Akihiro Yano for Koichi Sekikawa and Teruyoshi Kuji. 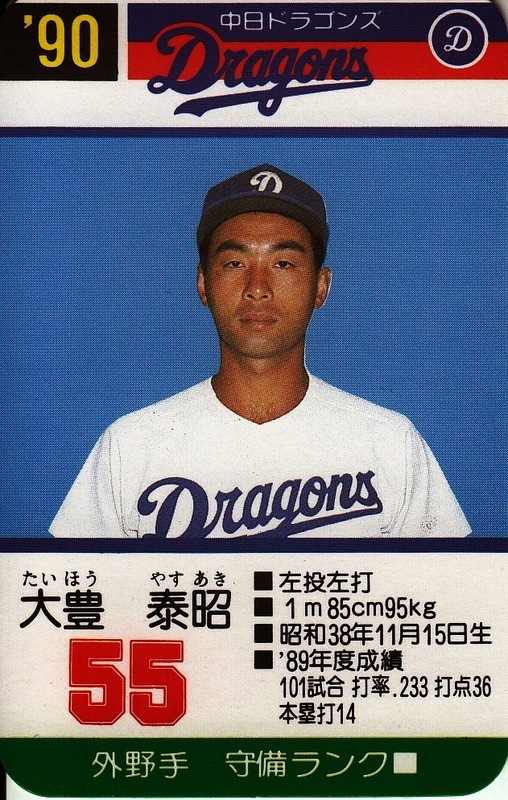 He left the Tigers as a free agent after the 2000 season and returned to the Dragons. They released him following the 2002 season and he retired when he could find no other team to pick him up. 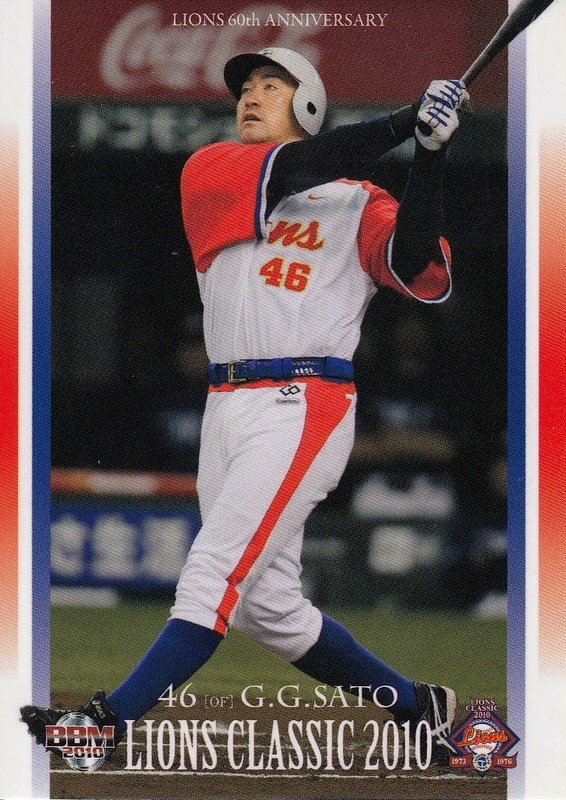 He did some scouting for Chunichi after he retired and helped sign Wei-Yin Chen. 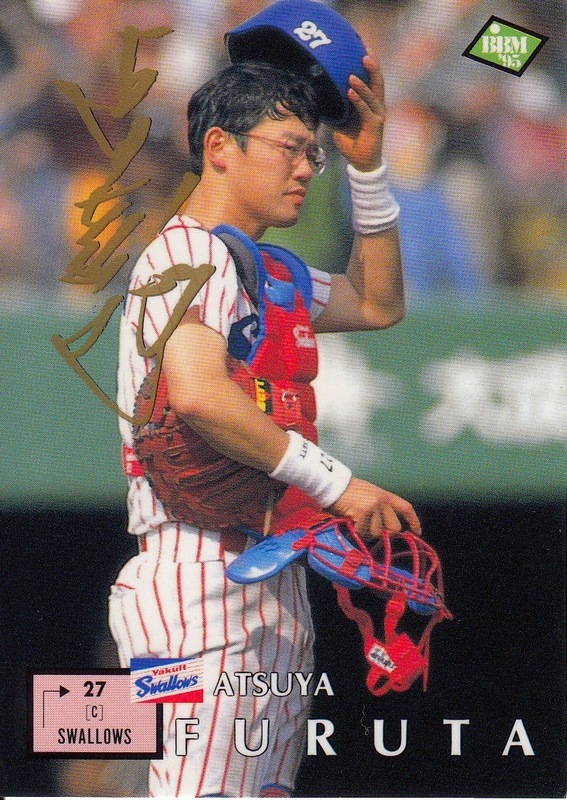 His brother, Ta-Shun Chen, played for Lotte in 1991 and 1992 under the name of Masahiro Taijun.